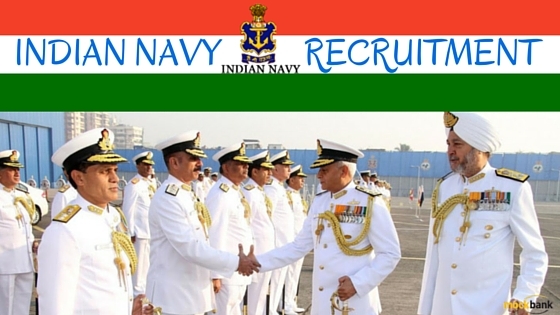 Indian Navy Recruitment @ www.joinindiannavy.gov.in is inviting the online Applications for the Posts given are the Naval Armament Inspectorate Cadre Jobs all over India. The Online Indian Navy Application Forms will be stated on Online form 04th August 2018 and the Deadline to fill up the applications are the 24th August 2018. This is the Good opportunity for Both the Men’s and the Unmarried Female Candidates to get settled in the Central Government Job like this www.joinindiannavy.gov.in Recruitment in order to make the Candidates Career in a Better manner. Use this Opportunity and get settle the Candidate Life in the Indian Navy Board. These Opportunities will change the Candidate Life if once they get settled in the Indian Navy Recruitment Board. Navy provides free medical facilities, Leave Travel Concession (LTC), Rail concession and Canteen Facilities for self and dependents, Mess/Club/Sports facilities, Furnished Govt. Accommodation as well as Car/Housing Loan at subsidized rates. For this Facilities candidates can lead a happy life. So within the End Date the candidates needed to Submit their Indian Navy Application form on or before 24-August-2018. All the Details Regarding the Indian Navy Recruitment Notification have been issued in this @ recruitmentindia.in Page or they can check it from the Official Notification. Foremost thing for the candidates needed to keep in the mind about the www.joinindiannavy.gov.in Job Vacancies that, the Female candidates who are going to apply they should not be married one. And in the Training Period, if any candidate finds that, they are going to marry, they will be rejected form the Indian Navy Board and all the Expenses that the Government has paid to that Particular candidates, they have to return it back. So candidates are conscious and make the Good Commitment and then only able to start to fill the Indian Navy Application Form for the Indian Navy Recruitment Notification. Candidates who have passed Engineering Degree or are in the final year of Engineering course in any of the undermentioned disciplines from an AICTE recognized educational institute with 60% marks till 5th/7th semester in regular/integrated course respectively. 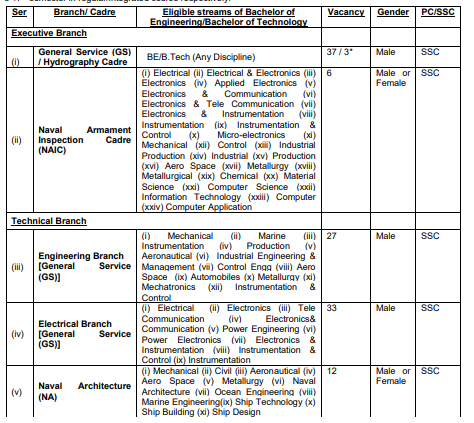 Candidates who are Studying their Final BE/BTech they can also eligible to apply for this Indian Navy Recruitment. Females and Unmarried Women can also eligible to apply. Based on the SSB Interview Selection Process, the candidates will be able to get the job.SSB interview will be conducted in two Stages. Stage I test consisting of Intelligence Test, Picture Perception, and Discussion test will be conducted on the first day of arrival at SSB. Candidates who fail to qualify in Stage I will be routed back on the same day. Various vacancies are applicable. As per the Authorities selected the Vacanies may be Increase or Decrease. Indian Navy Selection process for the Indian Navy Naval Armament Inspectorate Cadre Posts is Based on the SSB Interview. Present, there are 37 Vacancies are waiting for the Both unmarried males and the Female candidates. After the SSB interview, the finalized candidates have to undergo the Medical Fitness Test. All the Details about this Indian Navy Recruitment like the Educational Qualification, Age Limit, Selection Process, Vacancy Details, Application mode and the Details and measurements about the Medical Fitness test all we have Included in this Page. So that after Submitting the online Application Form, Candidates are able to maintain the Medical fitness correctly which is Used to get Qualify in this Indian Navy Recruitment Process. At the Tim of filling the Online Indian Navy Application Form, candidates needed to fill their Application at one Time Only. If they did any mistake on it, There is no chance to re-correct again. First, they have to register their name in the Indian Navy Board. After that with the help of the Indian Navy Registration Number, applicants are able to fill up the Online Indian Navy Application Form. Upload all the Documents which is Asked in the Application. Then must be assured to upload all the documents in the JPG/FITT format. After successfully filling the Application Forms, they needed to take the print out of that Indian Navy Application Form and then carry to the Interview time. More latest Employment News, Visit out Page.